Retro inspired. However this is not the vintage decor of your grandmother’s in her suburban home, but cleaned up (much like Uncle Irv) and redesigned to fit any contemporary space that is reminiscent of designs straight out of Tribeca. 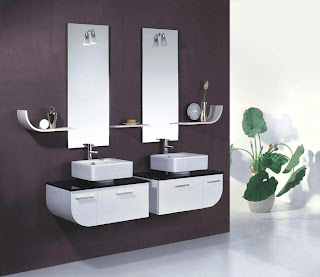 The sink basin itself, black with chrome hardware and glass counter is stacked upon additional counter space allowing for more easy convenient space saving storage. 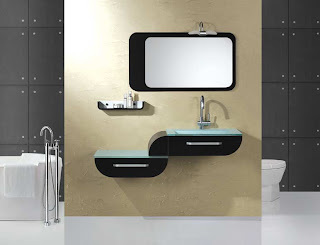 Included as well is a free standing shelf and mirror. Hot with red glass counter top and shelves. 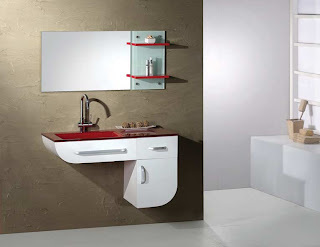 Space saving with crafty drawer space completes this tasteful vanity of chrome, red and white. Contemporary Post-Modern. This would be the contemporary take on 1960s artwork. Akin to furniture showrooms in Midtown Manhattan, purely the best. Combined geometric concepts with rounded edges make this a very appealing piece. Great for a master bathroom. Plenty of cleverly designed storage and shelving space. 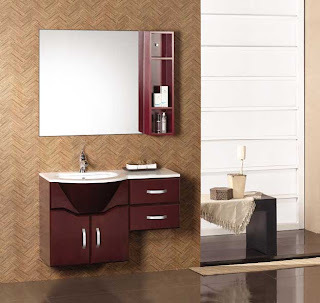 Italian inspired design of mahogany shelves, chrome hardware and white counters, make this piece a exquisite addition to any bathroom American or otherwise. Comes with free standing shelving unit that completes this classy chic ensemble ideal for any situation.